Yipee! Spring is finally here! Although if you ask me it sure seems like spring was here last month and we’re back into winter now that March has finally rolled around…whatevs I’ll stay positive. Because I’m sending out good vibes. Anyway, this month’s Recipe ReDux is all about spring cleaning, and man have I been needing some deep cleaning. Don’t worry, I’m not done. My roommate would probably agree that my closet needs a serious overhaul. I swear it’s going to implode one of these days. Why do I need 20 sweatshirts? Minimalism at its finest, right? So I obviously haven’t tackled the closet, and the pantry still needs help, and while I’m at it my whole apartment probably does too…BUT I did clean out my car. My car was long over do. A few months ago I picked up a gallon of milk for Greg, popped it in my truck, and headed over to drop it off at his place. When I got there I grabbed it from the trunk and, wham! It was one of those moments where you expect something to weigh a certain amount and it’s surprisingly lighter than you remember it being. Out comes a half-full gallon of milk. It had been sliced by some unknown suspect and proceeded to flood (OK, maybe an exaggeration) my trunk. Plus, on this particular day, it was the last straw that broke the camel’s back. Already irritated, tired, and frustrated this spilled milk didn’t help. Crying and furiously pulling things out of the trunk, Greg tried to make light of the situation with a joke I all but teed up for him. “Don’t cry over spilled milk”. I swear. I could have dumped the rest of the milk on him. Fast forward through the tears, we rinsed off my trunk liner and laid it outside to dry. After a thorough 5-day dry, I put it back into my car and moved on, only to have a suspicious smell waft through my car a couple of months later. The problem is that it didn’t waft back out. It stuck around, and all I can tell you is that it smelled like sausage. More times than I can count, I searched for the cause of the smell but never found anything. So I continued to blame the milk. I spent this past weekend at my parents and used it as an opportunity to give my liner a good scrub and power wash. I was bound and determined to get this stench out of my car once and for all. As I started throwing the contents of my trunk onto the driveway, out came a beach towel, an internet router, 5 waitressing aprons, high heels, clothes hangers…but then…I grabbed a grocery sack. Gold. It was even tied shut. Not only was I holding this mysterious, smelly thing, I had to work to find out what it was! Yup, a rotten onion and two heads of garlic. Sausage wasn’t so far off after all! Woof. A few minutes of disgusted laughter and an unbelievable amount of Lysol, my car smells significantly better, but it still has a slight tinge to it. Note: I did scrub and power wash! I can’t think of anything more seasonal than spring rolls. Packed with crispy-crunchy vegetables, fresh herbs, and shrimp or avocado, it just doesn’t get tastier, or healthier. In my opinion, if I am going to prep for spring rolls, I’m going to make more than two, and that means I’m feeding a few. In other words, they’re party food, and party food requires options. This is why shrimp and avocado are both listed in the recipe. Avocado for you veggie friends and shrimp for your protein peeps. Or they don’t get an option and you add both! One last note, don’t skimp on the herbs, this is really what people come for. Here’s to spring, spring cleaning, and throwing out everything that’s rotten! 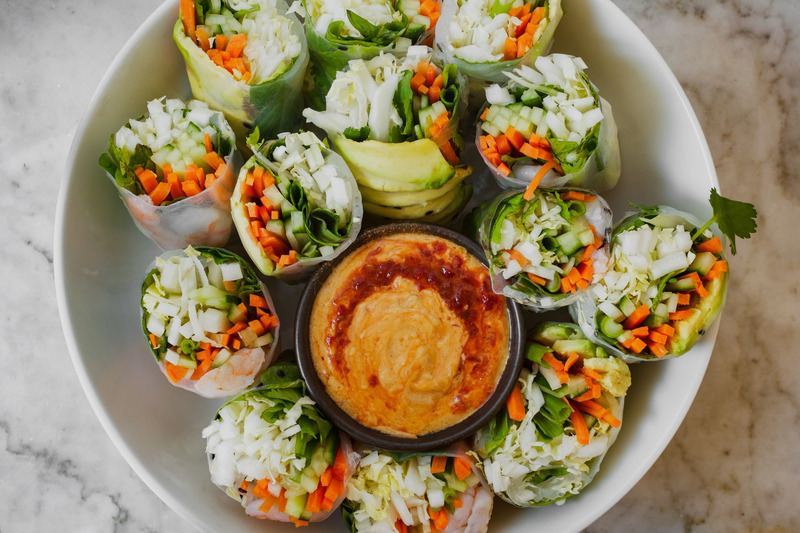 Crisp, crunchy, and full of flavor, these spring rolls are the perfect healthy appetizer for any occasion. With two variations, some with shrimp and some without, everyone is happy. Fill a large bowl or 12-inch skillet with hot tap water. Working with 1 sheet of rice paper at a time, soften paper by soaking in hot water until pliable, 20–30 seconds. Gently lift paper from water and run fingers down its sides to remove excess water. Transfer paper to a smooth work surface or plate, lay flat and smooth out any creases or folds. Sprinkle softened rice paper with sesame seeds then arrange a few slices of avocado or shrimp (depending on if you are making it vegetarian or not) in a line on the bottom third of the paper. Top with a layer of cabbage, carrots, cucumber, green onions, basil leaves, mint leaves, and cilantro leaves. Lift bottom edge of paper up and over filling, gently tuck towards you to secure, then fold in sides and continue to roll like a burrito. Transfer to a serving platter and repeat with remaining rice papers and filling. Cover spring rolls with a damp paper towel until ready to serve. Whisk together almond butter, ponzu, 1 tablespoon water, lime juice, vinegar, chili garlic sauce, honey, ginger, and garlic. Thin with additional tablespoon of water to reach desired consistency. Spring rolls can be made up to one day in advance, although they are best fresh. To store spring rolls, cover with a damp paper towel, wrap in plastic, and refrigerate until ready to serve. Instead of avocado you can also use thinly sliced extra-firm tofu, thinly sliced tempeh or shredded jackfruit. Instead of the shrimp you can also use cooked crab meat, cooked lobster meat, cold-smoked salmon, or sushi-grade tuna. P.S. 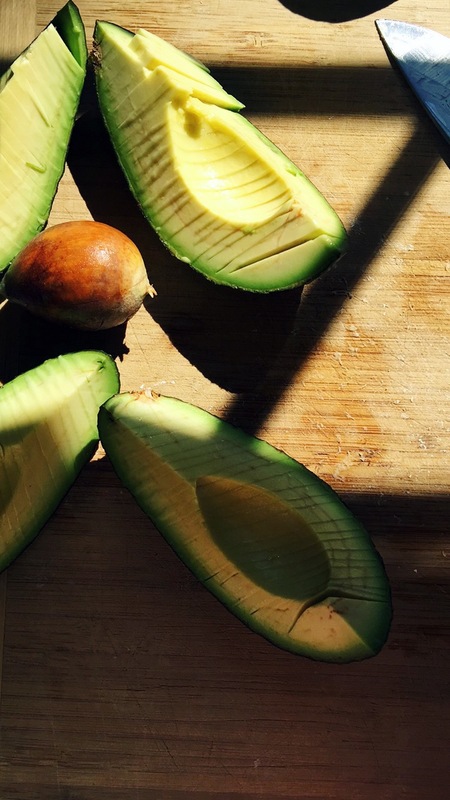 I recently watched this video from Heidi Swanson on slicing pretty avocado. I don’t usually slice an avocado like this, but I’m going to start! It’s actually pretty easy, and let’s be real. Anything from Heidi is amazing. 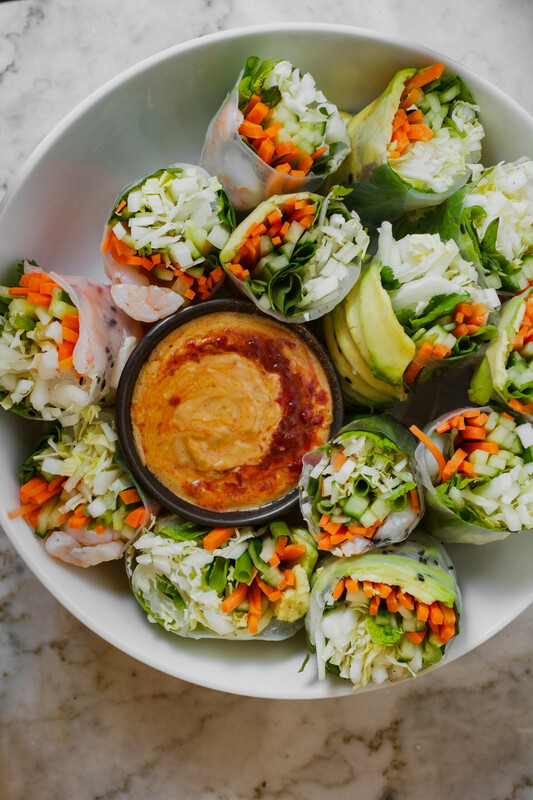 These spring rolls look so beautiful and delicious! Love the almond butter sauce! Oh boy – I’m glad you finally figured out the smell – been there and done that! BTW these rolls look amazing!! These looks so wonderful! Packed with flavor and gorgeous, what could be better?! Thanks Jessica! Food can be beautiful, but it better be tasty too! 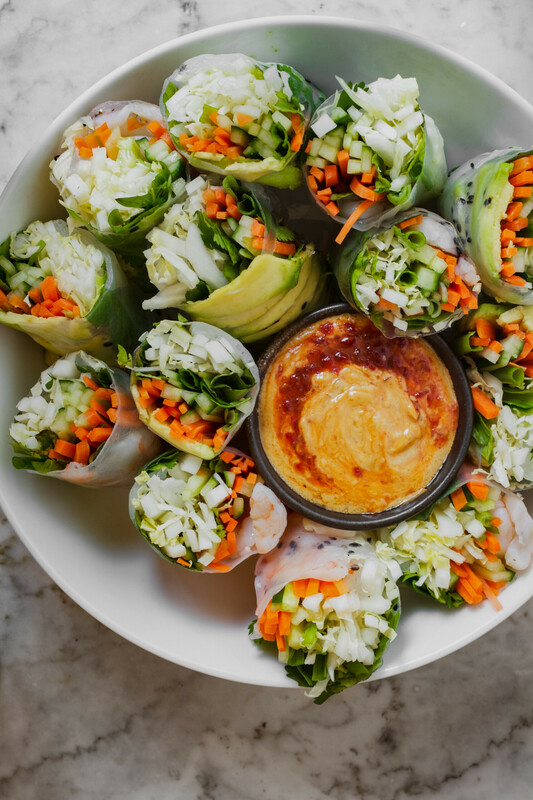 That sauce sounds amazing – now you have me craving some spring rolls! So clever to use almond butter! Can’t wait to try this! Thanks Kathryn, I hope you enjoy! haha, I’m totally with you on spring playing hide and seek. :[ I wish it’d stop being such a tease! …but in other news, these spring rolls look fantastic! I’ve never tried making my own, but I really need to! They are definitely worth making. It takes making a few to get the hang of rolling them, but they’re so fresh and so tasty! Yum! This just reminded me that it’s been far too long since I’ve made spring rolls of any kind. Going to fix that this weekend! Thanks Katie! 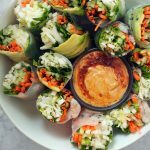 I love making spring rolls because you can do so many different things with them. They’ll be the perfect appetizer this weekend!